I love making ice creams at home and as we are approaching summer in the next few days,ice creams are best to enjoy in this perfect weather.Homemade ice cream also gives us an advantage of making our own flavor of ice creams with no added preservatives,fresh and pure.You don't actually need an ice cream maker to get a smooth ice cream.With few trials,you can become an expert in churning your own flavor of ice creams.I already have a mango flavored ice cream with just two ingredients-duet ice cream,check that out here.Duet ice cream is perfect for adults as its a fat free version of ice cream with just fruit and you can enjoy the same flavors.But with kids,they need the same look and taste alike ice cream from stores.And so we end up adding cream.This is one such ice cream that can be whipped in few minutes and can be enjoyed after freezing.We love mangoes and mangoes are pretty much everywhere in season.How about trying this ice cream with your favorite fruit?? Do try and enjoy !! Click this link for all mango recipes(ripe and raw) from this space. Chill the bowl to beat whipping cream for 15 minutes in freezer and then,add whipping cream to the bowl and beat until soft peaks about 2 minutes on medium speed. In the meantime,wash & peel the mangoes.Chop them in cubes and add to the blender,discard core.Puree the mangoes (without adding any water) to a smooth paste. 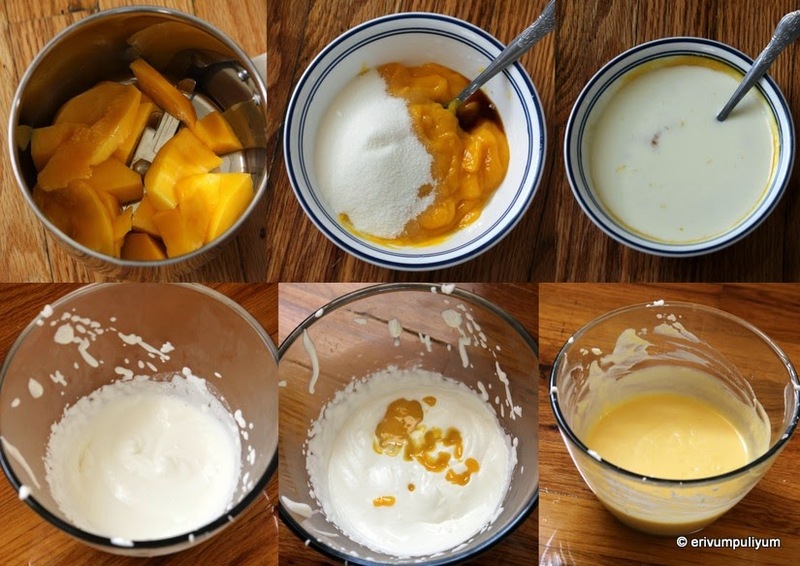 Gently add this mixture to the whipped cream and fold in completely(gives a custard color). Cover it air tight and freeze for 2 hours until its lightly set.If you have an ice cream maker,then go ahead with the manufacturer's instructions.Add this mixture to the blender and blend again smoothly.Pour back to the same bowl and cover.Freeze overnight to get smooth delicious ice cream. * You can make the same ice cream with store brought mango pulp too. * Add a few strands of saffron or add yellow food color too.I haven't added any food color or saffron threads. * If you have time,try repeating the step of freezing and blending one more time which breaks the ice well and gives more smoother ice creams. * I just made a small quantity as I didn't have whipping cream for a larger batch,but few days later made a big batch by doubling this recipe. For more ice cream recipes,check the link. awesome ice cream............perfect for this summer.love to have it any time. Oh, dear, it's a must. Love your recipe and I'll save it. Love your recipe, simple and tasty! Perfect ice cream for summer! Looks so delicious!! Mangoes are one of my favorite things ever. This ice cream sounds so good! Just perfect for the hot weather here in India, ice cream looks delicious..
nice way to use up mangoes and devour too. What a fantastic ice cream.Fabulous pictures too.